What are other examples of interspecies communication? A beautiful beluga gets a heads-up on a pod of bottlenose dolphins. New research documents a fascinating account of interspecies communication between bottlenose dolphins and a beluga whale. What sounds do dolphins use to communicate? echolocation clicks. Echolocation, also known as sonar, describes the ability of some animals to emit high-frequency sounds and determine an object’s distance by the time it takes for those sounds to echo back to the animal. In addition to distance, echolocation allows animals to estimate the size, shape, and velocity of an object. Learn more about “the porpoise of echolocation” with our study guide here. signature whistles. Each bottlenose dolphin has a “signature whistle” developed as a calf and rarely changed in the animal’s life. A signature whistle’s frequency is unique to each dolphin, and most likely used for location and identity purposes—much like a name. various sounds. Scientists describe a variety of sounds emitted by dolphins and mimicked by the beluga: short whistles or squeaks; short pulsed vowel-like sounds; combination “squeak and vowels”; pulsed tonal contact calls; and other pulsed sounds. What sounds do beluga whales use to communicate? Why might a virtuoso beluga imitate a bottlenose dolphin? They’re neighbors. 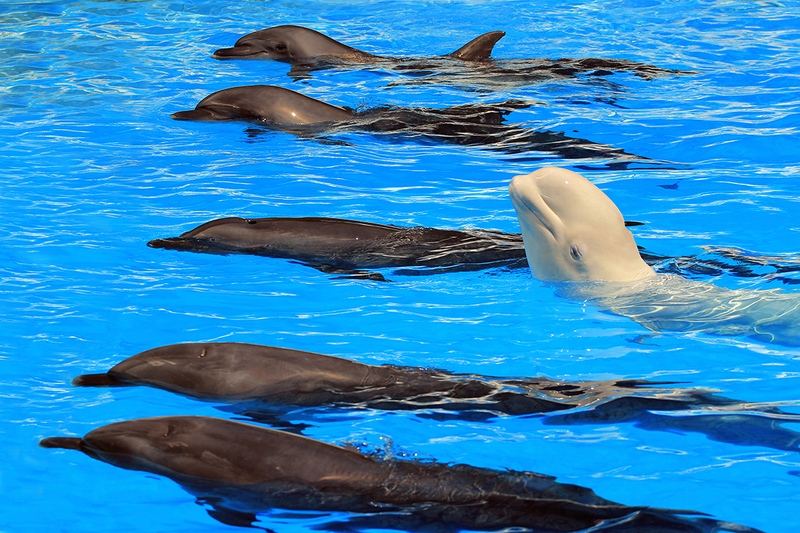 The captive beluga in question moved from a pool with other belugas to a “dolphinarium” surrounded by bottlenose dolphins. Some blogs have described the beluga’s behavior as “learning to speak dolphin.” Is this accurate—is the beluga directly communicating with the dolphins? It’s impossible to know, but it’s unlikely that the whale was actively, directly communicating with dolphins. Instead, researchers describe the behavior as mimicking or imitating. What are some other animals that engage in imitation as a form of interspecies communication? birds. The calls of bird such as mockingbirds, parrots, and brown sicklebills regularly imitate other animals, human speech, and even inanimate objects. Take a listen to why the male brown sicklebill is nicknamed the “machine gun bird” with our video here. belugas. Long before imitating bottlenose dolphins, belugas imitated the sounds humans make while underwater. Take a listen here.